Think I would add a "noggins" to simulate another joist running at 90 degrees to the existing joists. Hide the wire in that. Use same timber and finish as the existing joists. Perhaps make it half or 1/3rd as deep (tall) as the existing joists so it doesn't create an "egg box" look. It's a very odd way to build a floor but if the if the floorboards are 50mm thick then I can't see a problem with it structurally. As for running wires across the ceiling, it's perfectly acceptable to drill holes in joists to run wires, there are rules as to how big and where to drill them but for a 10mm hole for a single wire you could drill it anywhere you want. Those joists do look very far apart to be supporting the floor above. They are 2" pine so . I wouldn't want to hold a party or sleepover in the room. That is where the Faux would come in hand as you can make it look like a beam. If I run up through the closet I assume we'd have to run cross wise through the joists, which seems like something that should be avoided? there is a tiny gap between the top of the joists and the grooves of the floor, unsure if a wire could get through there or not though. Otherwise I think it'd have to run along two walls before it swings back around to the middle. The joists are very beefy and the floor above is 2" pine so I assume it's all well supported considering I've never had a professional/inspector in the house who made a comment about it. I think it's fairly standard in this sort of home construction. A good place would be inside the closet if it's possible. Those joists are much too far apart for a supporting floor? Thanks for the reply! I know for a fact that the the "ceiling board" is in fact the second story floor. If you spill water upstairs, it will sometimes leak down into the the first story room. Also you can see it on our landing above our kitchen that it is only one layer of floor boards above the joists. I hadn't thought about running a faux joist, that's interesting. I'll have to look into that! I had considered "dropping" the ceiling so to speak and adding a second layer of wood boards to hide any electrical above. The added benefit of this would be that we could put some sort of sound barrier between too. My husband's office desk is right above our bed and I can almost hear every tap of his keyboard when I'm in bed. Not to mention if he's listening to music or skype calling. Does anyone have any guidance on running wire up through an exterior wall? In my head this sounds difficult but maybe I'm overthinking it. However, I wouldn't like to spoil the effect by covering it up. By way of a solution, you could use false joists either over the existing joists or diagonally between them and run any cables in the gap. Have you thought about plasterboarding between the joists? That way you would create a void between the plasterboard and the flooring in which you could run wires, add some sound insulation and create a support for the ceiling fan. So we have a 30 year old timber frame home that has a number of lighting issues we'd like to address. For the typical reasons with these sorts of houses, we have vaulted ceilings with only a few recessed lights, which means certain rooms can be very dark. One of the first places we'd like to address this is in our first floor bedroom. In the attached picture those two side table lights are the only lighting for the room, leaving the other half of the room (where all our clothing storage is) nearly impossible to navigate in the evenings. The problems I see with trying to add some sort of a ceiling light to the space is how to run the wiring, and how to attach (what we'd prefer to be) a ceiling fan to the center of the ceiling. The pine tongue and groove you see at the very top is the upstairs floor. It's the only layer between the two rooms. So I assume this will mean running some sort of raceway or conduit along the beams in order to get wiring out to the center of the room. 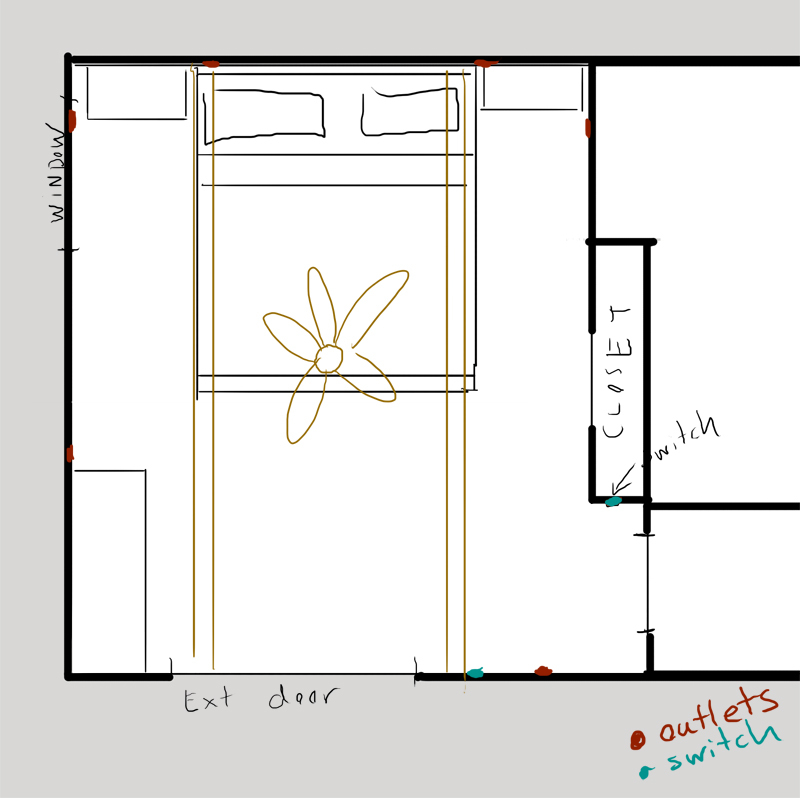 The most logical place I can think to do this is from the basement up through the wall behind the bed, but it's an exterior wall so I'm unsure how to approach this considering the insulation. Also since we'd want to attach the fan in the center of the room, this would mean attaching it to the tongue and groove which seems like a bad idea since it's not a proper rafter. 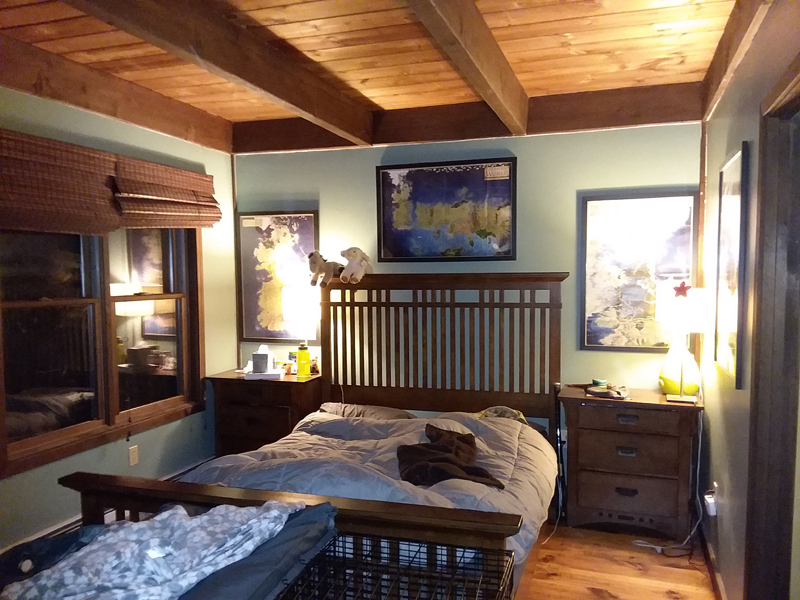 We were considering running an extra piece of wood across between the two beams to add some extra thickness to that area, but unsure if that makes sense at all or will just cause more problems. I guess I'm just looking for ideas on how best we should approach something like this, or if anyone has ideas that aren't apparent to us. I haven't been able to find much information in the form of running exposed conduit in a living space. Thanks so much, let me know if there's any more information you might need or if I wasn't clear about something.